On Tuesday night Save Our Skyline (SOS) held another packed meeting to hear of residents' concerns about the Conservative Administration's scheme for central Hammersmith. SOS reported record attendance levels. Developers Helical Bar Plc and Grainger Plc were appointed by the Conservatives as their preferred builders. They announced their latest plans in July. Councillor PJ Murphy (Lab) attended the public meeting along with other members of the Opposition. He said "The Conservative Administration has lost all perspective. They have already wasted millions of pounds on this project. 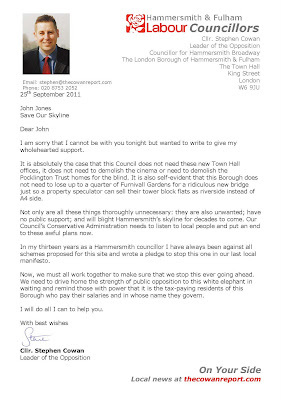 The fact is we don't need £35 million pounds of new offices for Town Hall bureaucrats and it is criminal to blight Hammersmith's skyline with high rise tower blocks; to knock down the cinema; and to demolish the Pocklington Trust homes for the blind." The impressive residents' campaign sent a clear message that the current plans are thoroughly unacceptable to the vast majority of local people. I agree. I was at the Labour Party Conference on that evening but you can view my letter of support by clicking onto the attached photo.